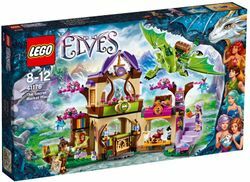 41176 The Secret Marketplace is an Elves set ireleased in 2016. Find the Secret Market Place with its enchanting residents! Join Farran Leafshade the earth elf, and Aira Windwhistler the wind elf, as they find the Secret Market Place, run entirely by animals! Meet Thorne the earth dragon and feed him pumpkins. Visit Owlyver the post owl at the post office and watch Flamy the goldsmith at work. Search through the library with Aira then help Farran use his magic earth powers to reveal the Book of Dragons’ hiding place! Includes Farran Leafshade and Aira Windwhistler mini-dolls, plus Flamy, Owlyver and Thorne the earth dragon. The Secret Market Place features 2 levels with stairs, a lever for activating the hammer in the goldsmith, opening drawer and a turning function to move the tree and reveal the sacred Book of Dragons. Includes Thorne the earth dragon, with space for a storage box and a mini-doll on his back. Travel with Farran and Aira to the Secret Market Place. Visit the post office and goldsmith. Search for the sacred Book of Dragons. Hop on Thorne’s back with Farran and go for a ride. Accessory elements include letters, treasure map, packages, pumpkins, sword, shield, lock, key, quill and ink. Thorne the earth dragon stands over 3” (8cm) high and 7” (18cm) long, with a wingspan of over 9” (23cm) wide. Secret Market Place measures over 7” (18cm) high, 11” (28cm) wide and 3” (10cm) deep. Facts about "41176 The Secret Marketplace"
This page was last edited on 11 January 2017, at 05:56.